How Does Sunscreen Work Anyway? Was she ever right about that price – but it was a lot higher than any of us at the time recognized. What sun addicts didn’t know then was that we were setting our skin up for damage to its structural proteins and DNA. Hello, wrinkles, liver spots, and cancers. No matter where your complexion falls on the Fitzpatrick Skin Type scale, ultraviolet (UV) radiation from the sun or tanning beds will damage your skin. Sunlight is composed of packets of energy called photons. The visible colors we can see by eye are relatively harmless to our skin; it’s the sun’s (UV) light photons that can cause skin damage. UV light can be broken down into two categories: UVA (in the wavelength range 320-400 nanometers) and UVB (in the wavelength range 280–320 nm). Our skin contains molecules that are perfectly structured to absorb the energy of UVA and UVB photons. This puts the molecule into an energetically excited state. And as the saying goes, what goes up must come down. In order to release their acquired energy, these molecules undergo chemical reactions – and in the skin, that means there are biological consequences. We also know that UVA light penetrates deeper into the skin than UVB, destroying a structural protein called collagen. As collagen degrades, our skin loses its elasticity and smoothness, leading to wrinkles. UVA is responsible for many of the visible signs of aging while UVB light is considered the primary source of sunburn. Think “A” for aging and “B” for burning. DNA itself can absorb both UVA and UVB rays, causing mutations which, if unrepaired, can lead to non-melanoma (basal cell carcinoma, squamous cell carcinoma) or melanoma skin cancers. Other skin molecules pass on absorbed UV energy to those highly reactive ROS and free radicals. The resulting oxidative stress can overload the skin’s built-in antioxidant network and cause cellular damage. ROS can react with DNA, forming mutations, and with collagen, leading to wrinkles. They can also interrupt cell signaling pathways and gene expression. The end result of all of these photoreactions is photodamage that accumulates over the course of a lifetime from repeated exposure. And – this cannot be emphasized enough — this applies to all skin types, from Type I (like Nicole Kidman) to Type VI (like Jennifer Hudson). Regardless of how much melanin we have in our skin, we can develop UV-induced skin cancers, and we will all eventually see the signs of photo-induced aging in the mirror. In the United States, the Food and Drug Administration regulates sunscreens as drugs. Because we were historically most concerned with protecting against sunburn, 14 molecules that block sunburn-inducing UVB rays are approved for use. That we have just two UVA-blocking molecules available in the United States — avobenzone, a chemical filter, and zinc oxide, a physical blocker — is a testament to our more recent understanding that UVA causes trouble, not just tans. 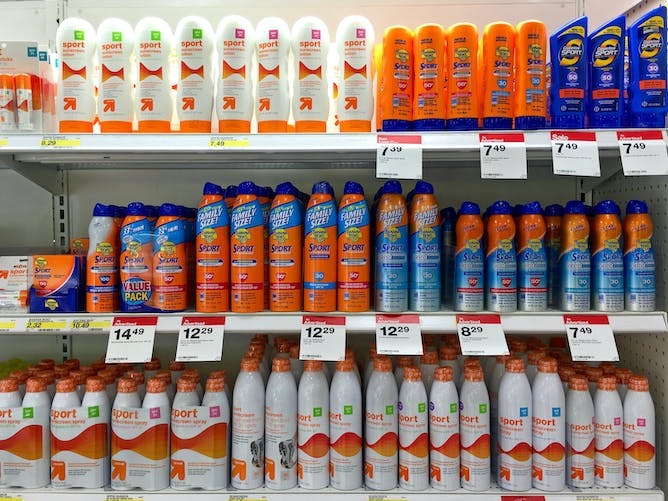 The FDA also has enacted strict labeling requirements — most obviously about SPF (sun protection factor). On labels since 1971, SPF represents the relative time it takes for an individual to get sunburned by UVB radiation. For example, if it takes 10 minutes typically to burn, then, if used correctly, an SPF 30 sunscreen should provide 30 times that – 300 minutes of protection before sunburn. To get high SPF values, multiple UVB UV filters are combined into a formulation based upon safety standards set by the FDA. However, the SPF doesn’t account for UVA protection. For a sunscreen to make a claim as having UVA and UVB protection and be labeled “broad spectrum,” it must pass FDA’s broad spectrum test, where the sunscreen is hit with a large dose of UVB and UVA light before its effectiveness is tested. But the broad spectrum test really came into effect only once the UVA-absorbing molecule avobenzone came onto the market. Avobenzone can interact with octinoxate, a strong and widely used UVB absorber, in a way that makes avobenzone less effective against UVA photons. The UVB filter octocrylene, on the other hand, helps stabilize avobenzone so it lasts longer in its UVA-absorbing form. Additionally, you may notice on some sunscreen labels the molecule ethylhexyl methoxycrylene. It helps stabilize avobenzone even in the presence of octinoxate and provides us with longer-lasting protection against UVA rays. Next up in sunscreen innovation is the broadening of their mission. Because even the highest SPF sunscreens don’t block 100% of UV rays, the addition of antioxidants can supply a second line of protection when the skin’s natural antioxidant defenses are overloaded. Some antioxidant ingredients my colleagues and I have worked with include tocopheral acetate (Vitamin E), sodium ascorbyl phosophate (Vitamin C), and DESM. And sunscreen researchers are beginning to investigate if the absorption of other colors of light, like infrared, by skin molecules has a role to play in photodamage. As research continues, one thing we know for certain is that protecting our DNA from UV damage, for people of every color, is synonymous with preventing skin cancers. The Skin Cancer Foundation, American Cancer Society, and American Academy of Dermatology all stress that research shows regular use of an SPF 15 or higher sunscreen prevents sunburn and reduces the risk of non-melanoma cancers by 40% and melanoma by 50%.